According to the National Stroke Association, stroke is the fourth leading cause of death in America and a leading cause of adult disability. Yet many U.S. adults aged 45 and older may have had a stroke without realizing it, a new study shows. The researchers wrote that people should learn the early signs of stroke and immediately seek emergency medical help if those symptoms appear. Some stroke medicines must be given shortly after stroke symptoms start, and those drugs can make a big difference in the outcome of a stroke. Some people recover completely from strokes, but more than 2/3 of survivors will have some type of long term disability. Our brain needs a constant blood supply to function. 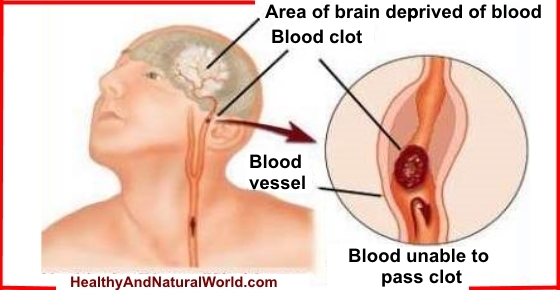 This blood supply provides vital nutrients and oxygen to the brain cells. The arteries are the blood vessels that deliver oxygen-rich blood from the heart to the tissues of the body. A stroke occurs either when a blood clot blocks an artery (ischemic stroke) or the artery bursts (hemorrhagic stroke), interrupting blood flow to an area of the brain. When either of these things happen, the blood supply to part of the brain is cut off and brain cells begin to die and brain damage occurs. In this case abilities controlled by that area of the brain are lost, and can include speech, memory and movement. The affect on the patient depends on where the stroke occurs in the brain and how much the brain is damaged, and can damage mind and body. A stroke can be small, in which the patient can experience for example a minor weakness of an arm or leg. But it can also be large stroke in which the patient can be paralyzed on one side or lose their ability to speak. Brain cells usually die shortly after the stroke starts. However, some can last a few hours, if the blood supply is not cut off completely. If the blood supply can be returned in the minutes and hours after the stroke, some of these cells may recover. There is also “mini stroke” (transient ischemic attack – or TIA) which is a temporary blockage that doesn’t cause permanent brain damage, but can cause stroke warning signs for minutes or even hours, and this is a warning sign that should be taken care of and not ignored. A stroke is always a medical emergency and therefore it’s important to recognize the symptoms of a stroke and to get help as soon as possible. 1. Sudden weakness or numbness in the muscles of face, arm or leg on one side of the body. Sometimes the patient is complete paralyzed and cannot even lift an arm. In other cases one side of the face droops and the face appear non-symmetrical when trying to talk or smile. 2. Sudden loss of speech or the ability to understand speech. The patient has communication problems and struggles to talk or create logical sentences and may appear confused or struggles to understand statements or commands. 3. Sudden loss of vision or trouble seeing clearly, especially in one eye. 4. Abrupt loss of sensation, such as lack of feeling on the skin, or other senses that can be affected, such as smell taste and hearing. 5. Sudden loss of balance and coordination, possibly accompanied by vomiting, nausea, fever or brief loss of consciousness. Often victims struggle to walk and lose their balance and coordination. 8. a decrease or loss of reflex, such as trouble swallowing when eating to the point where they gag. If you or someone with you shows any possible signs of stroke, don’t hesitate. Get emergency medical care right away. Immediate identification and quick evacuation to hospital will not “just” save the patient but in many cases appropriate medical treatment within three hours enables the patient to let get out of it unscathed! Your doctor may order blood test for checking the levels of the enzyme creatine phosphokinase (or, CPK) in the blood. If you have a stroke, it will cause CPK lab tests to show higher than normal results. 1. Face – ask the patient to smile and see if he/she can smile properly or if one side of the face droops. 2. Arms – Ask the patient to raise both hands together. See if one hand drifts downward or cannot be lifted. 3. Speech – Ask the patient to say a simple sentence. Check if their speech is strange or unclear. 4. Time – if even one of the above does not work properly – it’s time to call the ambulance immediately, describe the signs and give an exact location! Please forward this information to everyone who matters to you. For every ten people who receive it, you’ve probably helped to save at least one person! There are ways in which you can greatly reduce your risk of having a stroke. So if you’re up for it, then you’ve come to the right place! Engaging in moderate exercise decreases your risk of heart attack by 30% to 50%. So come, get your sneakers on and try to work out for 30 minutes of aerobic exercise at least 5 days a week. Regular exercise is a great way to maintain a healthy weight. It will improve your heart function and blood circulation, it will also lower your cholesterol level and maintain a healthy level of blood pressure. In some studies, drinking lots of alcohol has been negatively linked to stroke. For example, more than 2 drinks per day may increase stroke risk by 50%. If you are overweight or obese, then you don’t have to slim down to the size of a Victoria Secret model in order to reduce your risk of stroke. Be realistic with yourself. By losing just 5-10% of your body weight, you improve your cholesterol, lower blood pressure and blood sugar. High blood pressure and high cholesterol levels are major risk factors for stroke. Also people with diabetes are up to 4 times more likely to have a stroke. Here’s a shocking fact for you – One study found that 130,000 Americans die every year because they don’t take heart medicines the way their doctor told them. Are you naughty about taking your heart medication? If you are, you’re clearly not alone. So don’t feel ashamed. Instead, just work out what keeps you from taking your medicine. Is it side effects, cost, or forgetfulness? It is worth asking your doctor for help to find the right medicine for you. You are what you eat. So it makes sense to eat healthy. Need more encouragement? Ok, well maybe this fact will help; by eating a healthy diet full of wholesome foods, consisting of fruit and vegetables, whole grains, lean meats and fish, you could reduce your risk of developing a stroke by a whopping 25%. You can still have your cake and eat it, just not every day. Potassium rich foods – Furthermore, according to a new study by American Heart Association’s journal Stroke, consuming more potassium lessens your chances of having a stoke. Especially so in post-menopausal women. Foods high in potassium include: white beans, dark leafy greens, baked potatoes (with skin), sweet potato, dried apricots, baked acorn squash, plain non-fat yogurt, salmon, avocado, mushrooms and banana. Eat a little dark chocolate – Here’s some fantastic news: several studies show that people who eat dark chocolate more than once a week lower their risk of heart disease by almost 40%, of diabetes by about 30%, and of stroke by about 30%. The higher the cocoa content the better, so look out for good quality chocolate with a cocoa content of 75% or higher. This may sound like an obvious one, but it’s worthwhile reminding people. Even if you don’t smoke, but spend a lot of time with someone who does, then you are also at risk. It is shocking, but each year, about 46,000 people die from heart disease related to their exposure to second-hand smoke. If you are a smoker, you can find here 5 natural ways to quit smoking (scientifically proven). Some drugs, such as cocaine and methamphetamines, are risk factors for a stroke. Cocaine, for example, reduces blood flow and can cause narrowing of arteries which can lead to stroke. Sleep apnea is often undiagnosed, and studies indicate that as many as 1 in 15 adults has moderate to severe OSA. According to Mayo Clinic website, moderate to severe obstructive sleep apnea (OSA) has been shown to increase the risk of stroke by as much as three times in men. So if you have OSA, make sure to follow the treatment you’ve been given. This is a less obvious tip, but worthwhile following: getting your teeth cleaned every 6 months may lower your risk of heart attack by 24% and of stroke by 13%. A dentist can also recognize signs of heart disease — such as swollen gums or loose teeth — before you or your doctor pick up on symptoms, which means you can get treatment earlier. And indeed this is one of the surprising tips that I’ve mentioned in my previous article about 10 habits that harm your heart that you probably didn’t know about. It’s important to listen to your body and pay attention to any unusual symptoms, such as shortness of breath, changes in heart rhythm and exhaustion. Your doctor is there to help you, so don’t hesitate making an appointment. I’m talking to you, guys! Quit with the macho-attitude. Finally, the best steps you can take to reduce your stroke risk a are knowing your risk factors, following your doctor’s advice and adopting a healthy lifestyle. i am 52 yrs of age and just recovered from stroke. 2 days before i was stroked i feel numbness on my left hand and it’s shaking alone. after 2 days while i’m taking shower i just felt like there’s an earthquake and at once my right leg is falling down so i ran out of help and my daughters called the ambulance. so please when u experience it, don’t panic. call for help. Unfortunately there is not much you can do other than get the patient as soon as possible to hospital. I’m 32 and last year I had a mini stress related stroke. I have weakness in my right arm and shoulder, and I tend to mumble when I think I am speaking clear. My right head somewhere behind the ears stretching down to my right jaw feels a strange kind of DISCOMFORT if I lift my head up, tilt my head from left to right, and look down. Also, if i carry a SLIGHT weight, the same sensation is felt. Is this an early sign of stroke?? I think it’s best to talk about it with your doctor (I’m not a doctor and don’t have enough knowledge). You can read more about the causes of stroke and risk factors in Mayo Clinic and WebMD website.